People deserve to be safe from electrical hazards everywhere, and protection is especially important in homes. Developed expressly for residential electrical contractors and installers, the 2017 edition NEC® Pocket Guide to Residential Electrical Installations combines frequently accessed requirements for projects in one-, two-, and multiple-family dwellings. Throughout the Pocket Guide, requirements are listed in the same order they're followed during a typical installation, to help you improve your efficiency and accuracy! This edition of the Pocket Guide reflects the updated NEC, including the addition of Article 690, Photovoltaic (PV) Systems. Also new to the 2017 Pocket Guide: Shading for changed text, an "N" indicating new Articles, and deletion bullets to indicate text has been removed from that location. Order this compact reference developed exclusively by the NEC source! Work to ensure electrical safety in homes with the 2014 NEC® Pocket Guide to Residential Electrical Installations. Developed for electrical contractors and installers, the 2014 NEC Pocket Guide to Residential Electrical Installations has the requirements you need for projects in one-, two-, and multiple-family dwellings. As with previous editions, the most frequently accessed provisions for homes are listed in the same order they're needed in a typical installation, so it's ideal for residential jobs. The NEC has changed. Get equipped for electrical safety. Stay on top of electrical safety with the 2011 NEC® Pocket Guide to Residential Electrical Installations. 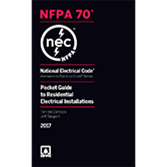 Work confidently and pass inspections with the official 2011 NEC Pocket Guide to Residential Electrical Installations -- the tool specially designed for standard installations in one-, two-, and multiple-family dwellings. As with previous editions, the most frequently accessed provisions for homes are listed in the same order they're needed in a typical installation, so it's ideal for contractors and installers. Preview sample pages from the 2017 NEC Pocket Guide to Residential Electrical Installations for examples of the valuable information you'll access.